After our articles directory blog update I have chosen to share really reasonable how to tips for blog admin / webmasters , Enterprise child theme on genesis framework is a child theme made for small enterprise , company , firms , services providers who needs a portfolio website where they can show case their companies works and services . 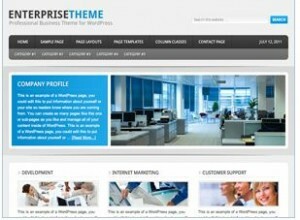 It is one of the best already made wordpress template that can be used for any level of company or organization . 1. Install wp-circle The initial image slider seen on the very top left of your child theme , built around the text is based on the wp-circle plugin which you can easily download various variation of the plugin by making a search on wordpress plugin directory for wp-circle . After install you need manually add the images you need for your slide to get your slider working . 2. You may want to install Vslider image sliding plugin Instead : by default wp-circle covers 600px width leaving 280px width for hometop 1 . You can tweak this design a bit to have at least something different from thousand and one other users using this child theme by leaving off the wp-circle plugin and using vslider instead , reason being that vsliser is more professional and can easily give you a well captioned image with jquery / ajax effect . you can also allow the vslider plugin to cover the whole (600+280)px width now the text will be written with transparent effect below your slider image , instead of occupying the left side . view px below for example. For users who want extra customization for their enterprise theme slider you need use css to wrap the sliding images or simply use custom css for the vslider from the edit menu (in fact using custom css files for your genesis customization gives you an edge over thousand other sites using same theme with you knowing that it’s a very popular framework) I have customized one for a client before making the slider cover the full width of the entire site (%150 width) thereby giving it a really different look . save and move to the next action . to the last line if you what you wanna drop up there is the secondary navigation menu . Now to position any of the navigation menu inline with the header at the right side , all you need do is go to appearance from your dashboard ==> navigate to widgets ==> drag the “custom menu widget” to the “header right ” and preview ………. 5. Install the Tiny Contact Form : This tutorial was written with wp novice at heart , so you wouldn’t wanna be bothering yourself with php snippet or code to use , tiny contact contact form makes it easy for you to drop the widget at any position of your choice , you can even drop the contact form at the third footer widget to make it possible for users to contact the company directly from the homepage .